If you’ve read some of my blogs before you know that already: I firmly believe that “small” and specialized labels are the most interesting source of Metal records. Don’t get me wrong; I’ve got nothing against important labels such as Roadrunner, Century Media, Metal Blade or Nuclear Blast… I actually buy some of their chunky “limited edition” CDs every single month (you know, the ones that come in big shiny digipacks with useless “making of” bonus DVDs). The thing is, these important companies do not (and probably CANNOT) have a specific and clear artistic orientation, as they must enlarge their audience as much as possible. Specialized labels however select their artists according to one very simple thing: their boss's taste! That’s why it’s most of the time a completely passion-driven and authentic decision. In fact, after following some labels for a while, I feel that I know their bosses almost personally, because I understand completely their musical tastes, just by listening to their releases. Awesome right? And so old-school: you don't need to listen to a CD before buying it, with these labels, you know just exactly what to expect! And yes: as you might have guessed already, Shadow Kingdom Records if one of those passion-driven labels. Their specialty is Heavy Metal, with a particular attraction for obscure and doomy stuff. This Pittsburgh-USA based label have made me discover some amazing new bands, like Argus, Sinister Realm, or Crowned In Earth, it has brought back from the dead the mighty Iron Man and it has reissued some hidden gems from the past like Deep Switch, Wolfbane, Revelation and so many more! This summer, there are 3 Shadow Kingdom Released you need to check out if you’re into Heavy Metal or Heavy/Doom stuff. And the first one I want to tell you about is also the strangest one. 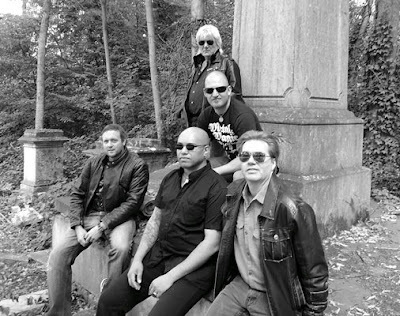 Coven have reformed under the name Coven 13 recently. Probably because of the other 256 bands called Coven around the globe. This US Heavy Metal band has existed quite briefly in the late 80’s, with only one official release, an LP called “Worship New Gods”. Back in the day, the band self-released it on vinyl only and split-up shortly after. And guess what, it’s now re-released on CD by Shadow Kingdom in a remastered version with a booklet including a bunch of old photos! Seriously, where the hell does Shadow Kingdom Records find these bands??!! Release after release, SKR's boss shows to be one of the finest Heavy Metal connoisseurs in the world. 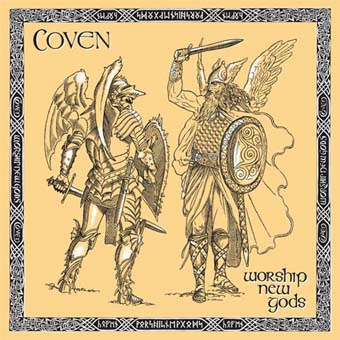 Coven sounds pretty much like a typical US-Heavy Metal band, with the sharp riffs and the taste for doomy atmospheres. Some might even classify it as “Heavy/Doom” which pretty much illustrates the global feeling of this record. I also must insist on the old-school taste of this one, just look at the artwork, the band photos and some details. The first song starts with a clear statement as singer David Landrum says “The Gods Made Men, Men Made Steel!”. Now that is HEAVY! I also love the old-fashionned effects in the beginning of “The Wicked Day” and “Loki”. This release may seem a little strange at first, as it took me some time to get into it, maybe because of the high-pitched vocals that sometimes get out of control. But when it did click, I really started to enjoy it, especially some songs like the aforementioned “The Wicked Day”, “Ruler” or even “Burial Ground” and “Jailhouse”. Another thing I like about this record is that I never really heard anything like it before... Some songs have a strange and very marked Gothic vibe like “Kiss Me With Blood” or “Threshold Of The New” (this one is like The Cure meet Heavy Metal!!). Last track “Loki” is also very original with a very unusual -not to say weird- structure and chorus. Trust me, this release is not just a rarity destined to a few Metal archeologists, as it sounds like nothing you’ve heard before, although a bit “dated” maybe, but hey, that’s totally part of it’s charm! 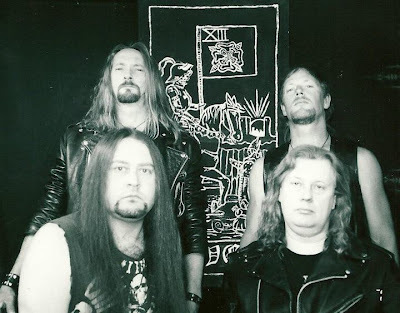 Second summer release on Shadow Kingdom is another rarity reedition, only this time around it’s by a much more famous band: Pagan Altar. "The Time Lord" had only been released on vinyl a few years ago and Shadow Kingdom brings it to you for the first time on CD. These tracks are the very first recordings by the band, done in 1978 and 1979, so yes; this is another historical release. I personally love this kind of very early Heavy Metal, still filled with hard-rock vibes and tons of BLUES. The feeling these guys have is just amazing, and it’s unbelievable that this band has been ignored for so long (although formed in the late 70s, their first official recording was released in 1998!). There are 5 songs on that release for a total running time of 32 minutes. The songs tend to be a little long, with multiple developments, essentially led by Alan Jones (accompanied by Les Moody on the songs “The Time Lord” and “Highway Cavalier”) who does a fantastic job on the guitars (both acoustic and electric). The song “The Time Lord” is truly one of my favorites on this EP, with it’s 8 minutes of pure transcendental pleasure. “Judgment Of The Dead” is heavier, and really sounds like many of the “doom” bands you might know from our actual era (Glen Robinson’s bass also gives me the chills on that one). “The Black Mass” has a darker feeling, still filled with blues and some HEAVY riffing! Really impressive stuff for a song composed in the late 70s. 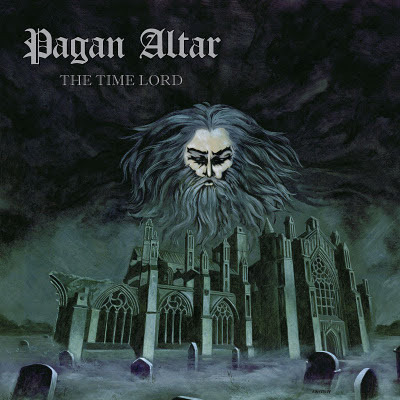 And that's when I realized that Pagan Altar could have been a real alternative for Black Sabbath, who are considered like the Godfathers of Heavy Music in general. History is sometimes so cruel… Last track “Reincarnation” is also a tremendous one, with a beautiful acoustic beginning that develops into one heavy and epic song. Terry Jone’s vocals are nothing short of impressive: full of blues and emotion. This EP is clearly an instant classic. What more can I say? As usual with SKR, the CD comes with a new and fantastic artwork. The last SKR release on the menu today isn’t another hidden treasure. Grand Gesture Of Defiance is Altar Of Oblivion’s second LP. And as the bio on the SKR website says, this is probably the best Heavy Metal band to come out from Denmark since Mercyful Fate. 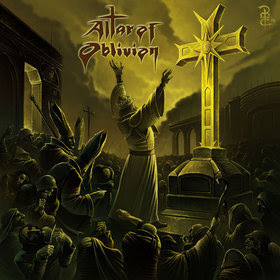 Altar Of Oblivion are however quite different from their famous predecessors, as their sound is much heavier and “doomier”. 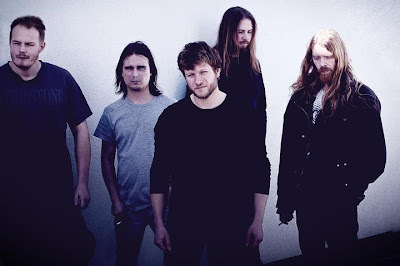 The guitar-sound is very thick and the guys have got a Scandinavian approach to their Heavy/Doom (this label perfectly fits the band): everything is so bombastic and operatic here. Just look at the artwork, the song titles and even the style of the booklet. Of course, the very demonstrative vocals also totally reflect that. It’s even clearly specified on the last page of the booklet (awesome artwork by the way); Mik Mentor doesn’t just handle vocals, he’s in charge of the “Stentorian Narration & Ars Melancholia”. There you go! All in all I really enjoyed listening to this record, because albeit being pretty classical in its approach, the band manages to show a unique personality, with a specific concept, a deep melancholia and an operatic attitude that does make a difference. These 3 releases are equally awesome, each one of them being different and special in it’s own way. If you’re into the SKR stuff, then just do what you usually do, trust the label and get these releases. If you are a metal archeologist interested by bizarre and original stuff check out Coven, if you like your Heavy filled with blues then you must get that Pagan Altar EP. Finally, if you're into Heavy/Doom Metal, then Altar Of Oblivion is a band you absolutely have to check out!